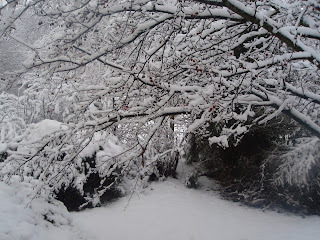 Photo (of part of our backyard): A winter wonderland may mask a day of serious dismay! Sameness seems to sooth my ten-year-old son's autistic soul. Changes challenge him. I suspect for many spirits on the spectrum, routines rule the day. Odd happenings like school delays and cancellations (as we encountered two days ago as a result of a snow storm) throw the person with Autism Spectrum Disorder off balance. Predictability presents the opportunity to understand what is going on in one's world. Unpredictability upsets everything and brings anxiety to the surface. This applies to both the person on the spectrum and for everyone surrounding them. How is one's child going to react to a two hour delay? Will a refusal to attend school threaten to ruin every one's morning? Or will showing a visual schedule, a visual clue (television announcement of the delay) or a social story help with understanding and acceptance of the new situation? Social stories and schedules can help, but they do not necessarily (as I have found) guarantee a smooth day that has radically changed for the person on the spectrum. The techniques may help get the child through the morning, but the stress of trying to accept the situation may wear him or her down by the afternoon--especially if there are two substitute teachers filling in for the well known ones (as was the case for us). So, perfect behavior in the morning can turn into shouting announcements into heating vents (for the echo effect) or hiding behind a display board. A trip to a time out room may ensue as well as a note to the parent (such as one I received) that the student had a so-so day. A (much appreciated in our case) social story that explains the the unacceptable behaviors and their consequences to the child (to be read as homework) also may be attached to the daily agenda. The goal of the social story is that the behaviors will not be repeated in the future--despite the predictability or unpredictability of any given day. So a great morning despite the occurrence of unpredictability may change into a so-so day or a not so good day for the student, much to a parents dismay. The only thing to do is to hold on to the tools and techniques that may or may not work and to pray for a tomorrow of predictability. A beautiful photo of your snow. I know all to well how challenging change can be.